Rear Admiral Fr. Louis V. Iasiello, Ph.d.
Keynote Speaker, Rear Admiral Iasiello is an alumnus of St. Bonaventure ﻿University. He has earned five graduate degrees, including a Ph.D. in the humanities, and is a graduate of the John F. Kennedy School of Government’s Senior Managers in Government Program, Harvard University. His dissertation is entitled: Jus In Bello: Key Issues for a Contemporary Assessment of Just Behavior in War. Published in numerous periodicals, he has been invited to deliver addresses and lectures at the nation’s war colleges. The Christian Science Monitor described him as one of the nation’s most important just war theorists; his article, Jus Post Bellum: Moral Obligations of the Victors of War, is on the required reading list for war college students. Commissioned as a Navy Chaplain Lieutenant (Junior Grade) in the Naval Reserves in 1981, Iasiello was recalled to active duty July 1983. His active duty assignments include: Naval Air Station, Memphis (83-85); U.S. Coast Guard, Kodiak, Alaska (85-86); USS Ranger (CV-61) deployed in Operation Earnest Will, and in other deployments to Korea and the Persian Gulf (86-87); Second Marine Division; (8th Marine Regiment, 2nd Marine Regiment, Marine Forces Panama) including two deployments to Norway, Operation Just Cause, Panama, and with the 26th Marine Expeditionary Unit, Special Operations Capable [MEU SOC] (87-90). 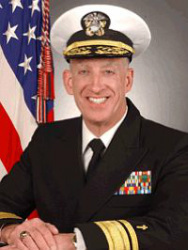 Other assignments include: Naval War College Command and Staff, distinguished military graduate (90-91); United States Naval Academy, staff and faculty (91-94); Joint Task Force 160 (Cuba and Haiti); Armed Forces Staff College (94); Assistant Fleet Chaplain, U.S. Atlantic Fleet and Deputy Chaplain, U. S. Atlantic Command (94-97); Director for Operational Ministry, Atlantic Fleet (97-98); and Director, Naval Chaplains School (98-00). After selection to flag rank, Rear Adm. Iasiello became the first Chaplain Corps flag officer to be appointed Chaplain of the United States Marine Corps and the Deputy Chief of Chaplains (00-03). The Senate confirmed his presidential appointment as the 23rd Chief of Navy Chaplains (July 2003-July 2006). As the Chief of Chaplains, he was staff corps leader for more than 2,400 active and reserve chaplains and Religious Program Specialists serving the Navy, Marine Corps, and Coast Guard. He served in that capacity during a time of national conflict. Other duties have included past membership on the Presbyteral Council of the Archdiocese for the Military Services, the Board of Trustees of Saint Bonaventure University, the Board of Directors of the Navy-Marine Corps Relief Society, the Board of Advisors for the Institute on Religion and Public Policy, and the Board of the Custody of the Holy Land. He delivered the annual Henry Hofheimer Lecture to the students, staff and faculty of the Joint Forces Staff College and was the keynote speaker at the Naval War College Annual Ethics Conference twice. After retirement, Father served as President of the Washington Theological Union, a graduate theology school. At the request of the Secretary of Defense, he was appointed by the President to serve as Co-Chair of the Federal Task Force on Sexual Assault in the Military Services. He has also served as a member of the Defense Task Force investigating violence and assault at the Military Academies. Father is a member of the Franciscan Order and now serves as a Professor of Theology and Formation director at the Pontifical College Josephinum, the only Pontifical Seminary in the United States.